There are a billion different ways to create a place for kid’s art. One of the billion ways that was overwhelming me was our kitchen refrigerator. No joke, gives my husband and I at least 10 little gifts a day. Sometimes it is a bite of her treat and most oftentimes, it is a piece she drew or painted. While I want to encourage her artistic ability, my refrigerator was starting to look like an advertising bulletin board. 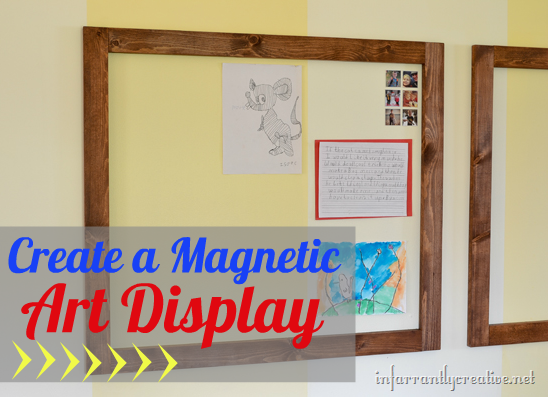 So I decided to make a blank wall in their playroom a magnetic wall to display art. Mod Podge is one of the most versatile mediums in my craft arsenal. It comes in a zillion different formulas and shine. The latest Mod Podge I got to try was the Image Transfer. Did you know you could use Mod Podge to transfer an image to fabric, wood, glass or virtually any other surface? I also added paint sticks to create a wood frame around it.